Note: This article was written in 2008. Ideas still relevant in 2016. Dan Bassill writes in his latest blog about one of the biggest challenges faced by non-school tutoring and mentoring programs: A lack of funding for general operations. 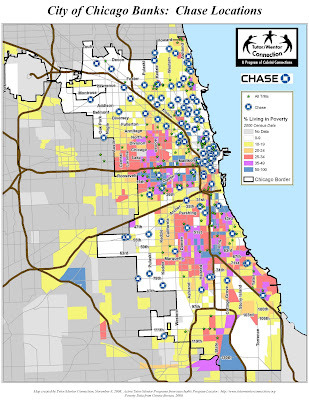 In fact, Tutor/Mentor Connection (where I work) is in the same building as Dan's T/M program, Cabrini Connections (which works with kids from the Cabrini Green neighborhood)... so I've had the unique opportunity to witness these funding struggles from the front-row. But funding isn't the only challenge faced by a not-for-profit like a T/M program. Work is also ongoing to recruit talented, dedicated staff and volunteers who will make long-term commitments to being part of such programs. And while, on occasion, small successes in recruiting and fundraising are celebrated (allowing operations to continue quarter-by-quarter), ideally, programs need to be sustained for years so that relationships can form, and volunteers and business partners can influence student aspirations and career choices. If only more businesses would invest in tutor/mentor programs, long-term, as part of their own human capital development. Dan explains, "If we can help more kids from poor neighborhoods move to jobs and careers, we diversify the workforce, and help find new workers to replace retirees who will be leaving the workforce over the next 15 years." Furthermore, it stands to reason that kids who gain skills through tutoring and mentoring move onto higher education and careers... escaping poverty... and ultimately having more cash in hand, as consumers, to ensure the growth of local markets for a business' goods and services. In past blogs, I've looked at how companies like CVS actually do have a strong philanthropic presence in the community. 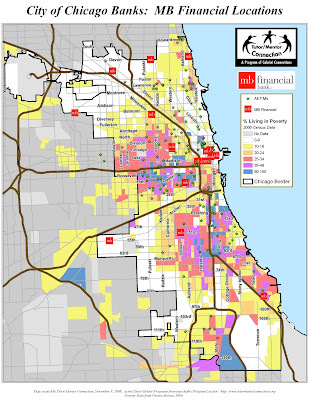 Today, I've created maps that help show how some of the major banks in Chicago might support the growth of tutor/mentor programs in neighborhoods where they have branch banks, and help recruit volunteers who travel to and from work via the major expressways, as volunteers, leaders and donors. 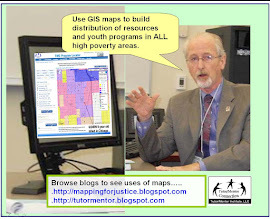 Please click on individual links to see how these maps can be used as tools to help banks and tutor/mentor programs work together for the benefit of everybody. Branches in the West and South parts of the city could be meeting places for community and business partners working together to help create new tutor/mentor programs in under-served areas. Park National has also been a sponsor of the annual Cabrini Connections Golf Benefit. Its branch in Roseland is near Salem Baptist Church which is led by State Senator James Meeks. That branch of Park National Bank could be a catalyst in the Roseland/Pullman area, for the growth of tutor/mentor programs. Branches in the North and Northwest part of the city could support tutor/mentor programs in this area, and help encourage volunteers from the suburbs who work at other businesses, to become part of tutor/mentor programs in areas where it has branch banks. Interestingly, MB Financial has been a sponsor of the annual Cabrini Connections Golf Benefit since 1995. 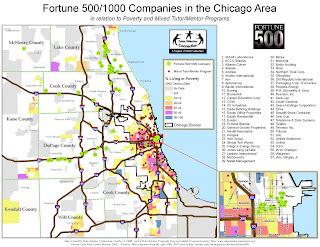 This is a perfect example of how local businesses in the Chicago community area can band together to host workplace fund raising, and other benefits, that support the operations of tutor/mentor programs in areas where they do business, while also supporting the role the Tutor/Mentor Connection takes in creating these maps and encouraging networking and information sharing. There are Citibank locations throughout the city, with branches in areas where there is a dire need for more volunteer-based tutor/mentor programs. In these neighborhoods, Citibanks can advocate for tutoring and mentoring on several levels - from helping to fund new and existing programs, to recruiting volunteers, to hosting meeting places. Chase branches are throughout the city, but there is a strong concentration along the Kennedy, and stretching through the North side of the city. You can click on the map image and see an enlarged version. As you look at each map, our goal is that volunteer teams form, who lead an on-going learning and leadership process, using the branch bank as a meeting place, an advocate for local programs, and even a potential site where kids and volunteers can meet once a week during non-school hours. Charter One's locations in the Southwest and South part of Chicago could help increase the number of tutor/mentor programs in this area, working with churches and other banks in this area. 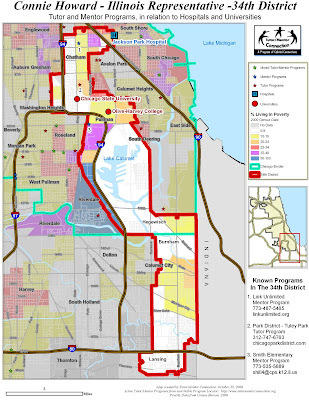 While there a dozens of locations throughout the city, notice the concentration in the area between the Eisenhower and Stevenson Expressways, as well as the Northwest part of the city. If teams form at one, or more branches of a bank with many locations, each team may take a different role in supporting neighborhood tutor/mentor programs. If these teams connect and share ideas via the Internet, and company-organized events, they learn from each other and build relationships that help in the workplace, as well as in developing and sustaining tutor/mentor programs. 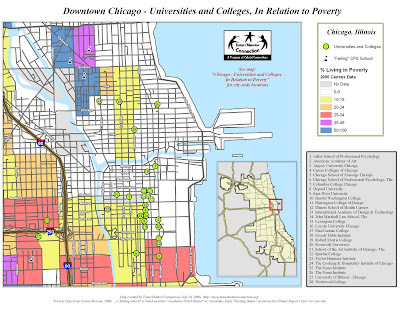 Mostly concentrated on the west side, on the fringes of some of the highest poverty regions in the city, Banco Popular branches along the Kennedy Expressway, and near Ogden Avenue can advocate for tutoring and mentoring on several levels - from helping to fund new and existing programs, to recruiting volunteers, to hosting meeting places. Recently, I posted several maps that examined the Illinois 15th State Senate District. Today I would like to focus in on the 34th Illinois House District, currently represented by Connie Howard. I want to emphasize out of the gate that when we make maps to showcase a political leader's district, the maps are not intended to show where service work is, or is not occurring. They are also not meant to endorse, or criticize elected leaders (The voters should make those decisions). So why do we create maps? Again, we are just trying to analyze specific areas in the Chicago area to see if the spatial data reveal any areas where where additional support for tutoring and/or mentoring programs may be needed... areas where underserved children live with disadvantages created by poverty and underperforming schools and, with a little help, may end up on a better path to higher education and fruitful employment (versus paths ridden with crime and hardship that are frequently exploited by the media). ... we see that Howard's district is made up of a slice of far-southern Chicago neighborhoods, and a sliver of near-south suburbs, cut in half by Lake Calumet. Interstate 94 runs most of the length, transporting potential volunteers past the impoverished Pullman, South Shore and Chatham neighborhoods on their commutes to work. I-80 and I-90 also pass through her district and may serve a similar function. We also see clearly that there are pockets of relative high-poverty, some associated "failing schools," and... as is often the case, far too few tutor/mentor programs. In fact, we know of only one tutor program, two mentor programs, and zero mixed full-service tutor/mentor options for parents and kids. Now of course, it is possible that other programs exist in the area, but are not in our database. We live far away and are not as in-touch with the community as those who live there. With this in mind, Hospitals and Universities can help the T/MC update its data, so that the information provided in our maps represent the most comprehensive, and up-to-date data. Perhaps, for example, the geography department at Chicago State can encourage student teams to research/unveil additional programs and resources... maybe working with us to practice mapping the communities in which they are closely invested. And, as was the case with Mt. Sinai Hospital in Lawndale, as reported recently by Dan Bassill, Hospital leaders at Jackson Park Hospital can perhaps work together to build strategies that create/support new and existing programs... or encourage staff to volunteer at existing programs? If you would like to learn more about these strategies, we have discussed the role of Universities and Hospitals specifically in previous blogs. As has also been discussed in prior blogs, Places of Worship and their congregations provide ideal hosting sites for new programs, as well as places where sermons can tie scripture to service, while pointing members to existing tutor/mentor programs. And of course, tutor/mentor programs are usually operating on shoe-string "not-for-profit"-sized budgets. Large corporations can invest in kids (their future work-force and future customers) by supporting education in their neighborhood through tutoring and mentoring. As mentioned in prior blogs, businesses need to dig into their philanthropic budgets to fund the programs. This is such a priority. Without funding, programs die and kids are turned back to the streets for guidance. Businesses can also encourage employees to volunteer. And/or perhaps they can use their web presence to educate the masses about opportunities to help T/M programs, and why it's so important... maybe they simply post information in-store, spreading the word to customers, clients, and parents? And of course, why do I mention all of this in the context of an elected political leader? Well, quite simply, no one guards the best interests of a population like an elected leader. And I can only assume these political leaders are strongly interested in the benefits tutoring/mentoring can bring to the families in their constituency. And in turn, improve the prospects for our children, our economy, and our democracy. Mt. 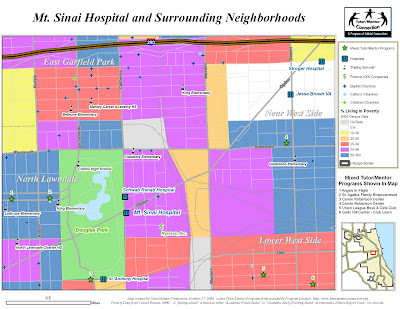 Sinai Hospital - How can this map be used by the surrounding community? Recently, Dan Bassill at Tutor/Mentor Connection reconnected with leaders at Mt. Sinai Hospital. He has encouraged them in the past to adopt the role of a Hospital Tutor/Mentor Connection, and reports that the Hospital has indeed launched a Tutor/Mentor program to assist the thousands of CPS students in the vicintity of Lawndale in their struggle to overcome obstacles presented by extreme poverty and underachieving schools. In his blog he breaks down, in amazing detail, how this map can be used by Hospital leaders at Mt. Sinai and elsewhere... by Fortune 500/1000 company Ryerson, Inc. ... and by the many faith groups near the hospital... each of whom can support the growth of tutor/mentor programs in this area through volunteering, funding, hosting, etc. Please give Dan's blog a read. It may the most thorough overview on how these maps can be (and hopefully are being) used. Just starting out, the S.O.N. Foundation has 20 kids involved and 10 mentors. They explain that they created the program in response to their recognition that someone needs to be "working with youth, developing their skills and turning them away from gangs and drugs" ... "because with out some help our youth will continue suffer." The solution again? Mentorship. Their philosophy is that "if a boy sees a man he can become a man" and through the efforts of adult volunteer mentors, children can become responsible and successful adults, "saving our neighborhoods one block at a time." But where do you start if YOU want to start a tutoring and/or mentoring program? Well, Mr. Douglas came to visit Dan Bassill at Tutor/Mentor Connection to pick his brain. As Dan says in a recent blog, "The Tutor/Mentor Connection would be happy to meet with your group to help you understand how to use [our] maps, and to coach you on building support for tutor/mentor programs. We'll host a conference on November 21 at The Chicago Field Museum. We hope you'll attend, and begin this learning process." Next, Mr. Douglas sat down with Nicole here, and the two of them collaborated to create the S.O.N. Foundation blog. This blogging/communicating process is essential. It is crucial that organizations active in tutoring and mentoring are sharing ideas, and broadcasting their messages/services. How else can we learn to better serve the kids? How else can kids and parents learn about us? How else can volunteers and donors have "Wow! I had no idea these programs even existed! I want to help!" moments? And of course, through an active web presence, awareness of the work others are doing, and potential partnerships can develop. And, well... as in any war, there is strength in numbers, right? By the way, maybe "Roseland Community" sounds familiar? Maybe you read my blog yesterday about how Illinois Senator Rev. 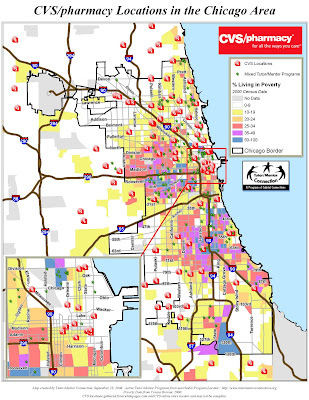 Meeks and his congregation at Salem Baptist Church of Chicago - in Roseland - might use my maps and the T/MC resources at the Tutor/Mentor Institute to increase support for tutoring and mentoring in his district and within the area surrounding the church. This is a case study in how this should all come together and work. And a great story on which to end the week. We here at The Tutor/Mentor Connection (T/MC) are always encouraged when community leaders use their position and visibility to spark debate in the never-ending search for solutions to failing schools and poverty. For the past several months, Illinois State Senator James Meeks has been an enormous sparkplug in the news, stirring controversy which has successfully forced these issues into the spotlight. For instance, over the summer, he blamed Chicago's Mayor Daley for the miserable conditions of schools in segregated and impoverished sections of Chicago. Senator Meeks has also been in the news recently for leading a boycott of Chicago Public Schools (whereby kids would skip the first day of classes and travel to enroll in prestigious New Trier High School in affluent Winnetka... in an effort to spotlight inequity in public school funding). And most recently, he was in the news during the Cubs' (brief) playoff appearance, when he organized a demonstration for school-funding reform by encircling Wrigley Field with parents and students during the Cubs' first playoff game. Now I'm not supporting or condoning the appropriateness of these strategies. But clearly they were effective in getting the stories toward the front page. Back in August, Dan Bassill wondered if this is enough. In a blog he wrote back then, he challenged both the media AND politicians such as Meeks, suggesting that, "writing infrequent, sensationalist, media stories; making speeches, and marching in the streets won’t get more people personally involved in helping other people’s kids grow up. [Meeks], the mayor, and the media need to be thinking of new ways to get business people (of all colors, and from the city and suburbs) personally engaged in the lives of economically-disadvantaged kids. To me, that means they should be talking about volunteer-based tutoring/mentoring... They should also be talking about how churches, banks, and community health centers in high poverty neighborhoods, and along the routes city workers take in coming and going to work each day, could be hosts to tutor/mentor programs... Finally, they should be thinking of ways to encourage people who go to church every Sunday might give 2 to 3% of their wealth each year to support these tutor/mentor programs... Non school programs need an infusion of private sector and corporate money. Who better to lead in the giving than people of faith?" And this is what makes Senator Meeks an interesting ally for all of us involved with tutoring and mentoring. In addition to being an influential politician who is championing efforts to improve schools and fight poverty, he is an influential church leader, presiding over the (large) congregation at Salem Baptist Church of Chicago on the far South side, near his 15th district. 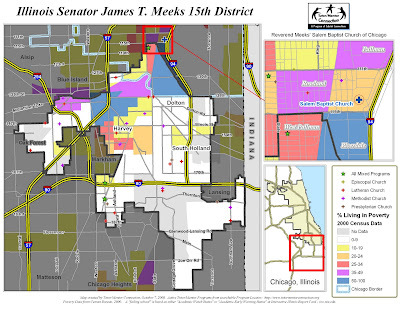 So with this in mind, I would like to explore how the Tutor/Mentor Connection's (T/MC) maps can be used as tools to help Senator Reverend Meeks and his constituents work to create strategies that promote the development of tutor/mentor programs. The left portion of the first map features the Illinois 15th State Senate District, currently represented by Reverend Meeks. The northern tip pushes across Chicago city boundaries, but the majority of his jurisdiction is "near-south suburban" and split among relative poverty and affluence. Please note that there are FOUR major highways here, two of which bring commuters directly into, and out of the city. Potential volunteers come through the district and could certainly help support Tutor/Mentor Programs in the 15th and elsewhere in the city. And speaking of mixed Tutor/Mentor programs, there are not a lot of known ones here, it seems. We currently know of a mere three (3) mixed tutor/mentor programs in the 15th district. This is not uncommon though - as we've seen, there just aren't enough anywhere. I'm completely confident, however, that Reverend Meeks (whose church and surrounding neighborhoods are featured in the inset map at the top-right corner of this map) would be interested in seeing this map, and working to increase this number of programs. How can I be sure? Well, his public service record is extremely impressive, serving as as the Executive Vice President of the National Rainbow-PUSH Coalition; as a member of the Board of Directors for the Chicago Fire Department, the Roseland Community Hospital, the Korean American Merchant Association, and the Olive Branch Mission. This second map features hospitals in his district (interestingly we know of no universities or colleges in this district). As we've discussed in earlier blogs, Universities and Hospitals have important and intimate relationships with their communities, and can work to support the growth of Tutor/Mentor programs. As pointed out above, Reverend Meeks already has a working relationship with Roseland Community Hospital. Perhaps he has already considered forming learning circles which can meet at the hospital - complete with hospital leaders developing engagement strategies that might reach more youth throughout the entire district. Perhaps he or other hospital leaders would like to know about the T/MC's presentation: Tutor/Mentor Hospital Connection. Lastly, and perhaps most-obviously, as pastor of Salem Baptist Church of Chicago, Reverend Meeks has the ear of over 24,000 followers. 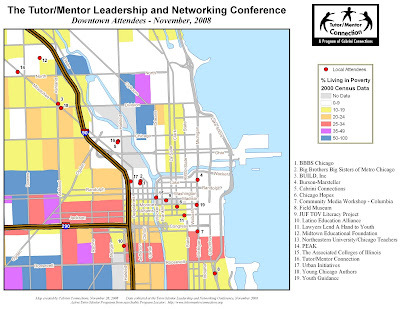 As discussed in the blog on Chicago's Places of Worship, the Tutor/Mentor Institute has a document called "How Faith Communities Can Lead Volunteer Mobilization For Tutor/Mentor Programs", detailing how all church leaders "can be delivering sermons on a regular basis, that tie scripture and service, and point members to tutor/mentor programs that already exist, or to neighborhoods, where new programs need to be created." Furthermore, Reverend Meeks's influence surely stretches beyond his congregation and into neighboring Baptist churches, Catholic churches, and other "general" Christian congregations in his district (shown in the map above). Also, there are Episcopal, Lutheran, Methodist, and Presbyterian churches within the influence of Reverend Meeks. Each of these locations represent additional sites where congregations can meet to learn about tutoring and mentoring, and where church leaders can evangelize to get donors to contribute to the growth of programs. Please refer also to Tutor/Mentor Institute's suggested communications strategy for Faith Communities. 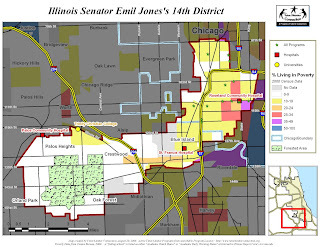 In sum, regardless of what you think of Senator Reverend Meeks's techniques in his fight against unjust forces that impede the progress of kids in underserved communities throughout in Illinois, you cannot deny that his heart and passion - and leadership both politically and spiritually - make him a perfect candidate to advocate on behalf of tutoring and mentoring. I am certain that the T/MC and Reverend Meeks will form a perfect alliance for this cause. I should mention, if it's not already clear, that these maps are not intended to show where service work is, or is not occurring. They are also not meant to endorse, or criticize elected leaders. The voters should make those decisions. What IS the Tutor/Mentor Connection? A Tour in Maps! This past week, Nicole at Cabrini Connections and Tutor/Mentor Connection (T/MC) asked me to join her for a visit to The Field Museum here in Chicago. The goal of the meeting was two-fold. First, T/MC is always looking for partners in their fight against poverty and The Field Museum does some incredible outreach work with kids throughout the city. There is a definite potential for collaboration and partnership here. Second, The Field Museum had shown interest in possibly hosting the T/MC's autumn Tutor/Mentor Conference (where tutor/mentor professionals meet and exchange ideas, side by side with anybody from the public who wants to come learn more about services available to the community and children). I was honored when Nicole asked me to come with a handful of maps, and invited me to demonstrate why maps are so important in the work the T/MC does. But honestly, I was a little nervous. How would they be received? I had never done this before. I decided to focus on clearing up any possible confusion as to what we do at the T/MC. Because the work that the T/MC does is really complicated, multi-faceted, and potentially confusing at first. "Tutor/Mentor Connection".... "Cabrini Connections"... sounds similar. What's the difference? What exactly does the T/MC want to accomplish? You can read about it... you can listen to us talk all day long... but maps give a visual to grab onto, and it's effective. I was really proud and encouraged by the enthusiasm the maps generated among our new friends at The Field Museum. And I'm excited to report that the conference will be held there on Friday November 21st. Thank you so much Julie, Clinton, Darnell, Mara, and Andy! I would LOVE the opportunity to come to any of your organizations to demonstrate the work the T/MC does through maps (please do ask). In fact, maybe I should give a little taste of this presentation right here in this blog for anyone who is confused! Simply put, "Cabrini Connections" is a single "Tutor/Mentor Program," where middle-school and junior high kids from the Cabrini Green neighborhood come to work with every-day professionals from around the area... working adults like you and me who volunteer their time, giving the kids extra help they need to achieve greater success and confidence at school... and ultimately go on to college and productive careers. 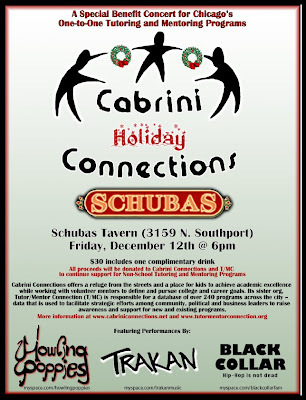 That's "Cabrini Connections"... a single program that focuses on kids in one small neighborhood. But more! T/MC is looking to share ideas, goals, and strategies among all programs (of which, again, Cabrini Connections is only 1 of 200+)... an exchange of ideas - to ensure that existing programs maximize their growth/potential with their particular group of kids. Many documents geared toward this sharing these ideas exist in the T/MC's forums and in their library - the Tutor/Mentor Institute. 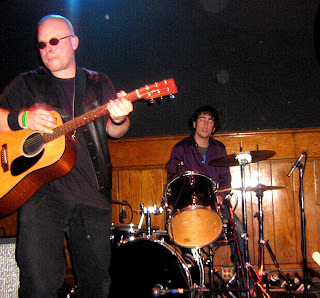 Additionally, T/MC occasionally organizes a semi-annual conference to bring as many people together as possible to exchange ideas and information in person. This is where maps are extremely helpful. This is what I do. Of course, we here at T/MC have mapped the locations of many other Christian denominations, as well as the locations of Jewish, and Non-Judeo-Christian faiths. I simply chose these two as examples. Next, I showed those at the meeting the map which illustrates how political leaders can organize resources in their districts, using the Illinois 14th Senate District map. Sounds great, doesn't it? Who would oppose helping kids, families, and communities in need? When I first got here, I assumed maybe the business community would be a little removed and cold toward programs that do not immediately affect their bottom line. We are excited to have a new relationship with The Field Museum. Please do let The Tutor/Mentor Connection know if you would like to hear more, join our network, partner up, become involved (volunteer, collaborate, spread the word, or donate)... or participate in the conference this fall. Up to this point, I've looked at the locations of known Jewish Congregations and Christian Churches. Of course, there are many in the Chicago area who adhere to faiths that are neither Christian nor Jewish. Followers of the Baha'i, Buddhist, Hindu, and Muslim faiths are also in strong positions to take leadership roles and "point members to tutor/mentor programs that already exist, or to neighborhoods, where new programs need to be created." Again, please take a look at the blog entry for Chicago's Places of Worship for more information on how this can happen, why it's so important, and how all faith communities - regardless of denomination or belief - can use the T/MC's strategies to increase the reach, frequency and consistency of tutoring and mentoring programs. Pay a visit to the T/MC website to get information about T/M programs in all parts of the region. And, go to the T/MC Program Locator, or the Interactive Zip Code Map to find locations of programs that can use your volunteer or donor help. Any rate, the reporter, Sandra Guy, was focusing on CVS' "Beauty 360" boutiques. While this has little to do with poverty and tutoring/mentoring, there was one line in there that made me start to think. "CVS expanded its Chicago presence two years ago when it acquired 60 stand-alone Osco drugstores and started building new stores in growing neighborhoods." Perhaps companies with multiple locations in a city... "mass market retailers such as Walgreens and CVS [who] are trying to position themselves into more of the heath and beauty and wellness areas," would be interested in working to develop the community's wellness in other ways. CVS LOCATIONS, shown with "Failing Schools"
So I headed to the company website and, sure enough, in the CVS "community" link, the corporate website states that "as our company continues to grow, and touch the lives of more people, we strive to make the biggest and best impact possible in the communities we serve." They explain that "giving back to our communities is a deeply ingrained value that has defined our culture since the company’s founding in the 1960s. Our Vision to improve the quality of human life inspires us to extend our support and try to make a difference. Our contributions, including grants made through the CVS Caremark Charitable Trust, corporate giving, employee volunteerism and in-kind donations, touch people from all walks of life, and reflect the diversity of the thousands of communities in which our customers, clients and colleagues live and work." Wow! This is exactly what tutoring and mentoring programs need. And not to single out CVS... they and their charitable spirit just got me to thinking. I bet there are tons of companies with a presence in every corner of the city - with locations in affluent areas as well as impoverished areas. All with an interest in the community. I realize that these mass-market retailers would have difficulty funding tutor/mentor programs near every location, but perhaps a company like CVS could work to develop strategies that help programs in every location get volunteers, donors, and support from other businesses, churches and hospitals. Perhaps they could sponsor the Tutor/Mentor Connection, creating a "be a volunteer tutor/mentor" link on their web site... or point to links like the T/MC web site which help people learn where, why and how they can be involved. Some companies may already even be using maps to plan store locations, or to analyze their philanthropy, social marketing, and volunteer involvement strategies. If companies share their strategies on their own web sites, T/MC can point to them as "best practices," and other companies can learn to duplicate good ideas in more places. This may seem at odds with the competitive nature of business. When Dan Bassill first proposed some of these ideas to me, my first thoughts were, "Companies sharing strategies? Companies "giving money away"? What's in it for them? Why would they do that?" As always, please contact the Tutor/Mentor Connection if you'd like to be a sponsor and if you'd like their help developing tutor/mentor strategies for your company. When on my way home, I saw the week's issue of Time Magazine, featuring McCain and Obama on the cover. The headline read, "Second annual National Service Issue." How perfect. Another exploration of this word "service" that both candidates keep throwing around. So I'll be looking at some of this issue's articles in the near future, highlighting instances where our maps and Time's stories on "service" might collide in the name of tutoring and mentoring. One section of this issue offers "21 Ways To Serve America" - a list of quick and easy ways you can serve America, each written by important leaders in different sectors of society. For instance, Lawrence S. Bacow, president of the prestigious Tufts University in Boston, contributed an essay titled "Get Your College Involved." He writes that "Colleges and universities have a special responsibility to educate the next generation of active, engaged citizens... If we are to address this nation's major challenges, we need people across the political spectrum to serve in government, to run for office and to work to build stronger, more vibrant communities... Helping young people pursue their passion for service is one of the best investments our society can make." I immediately thought of all the alumni and college-aged volunteers working with the "next generation of active, engaged citizens" at Tutor/Mentor programs throughout the city. President Bacow also references the fact that many "colleges have set up programs to facilitate community service." This is great news! Since they are in such close proximity to high-poverty neighborhoods where students have a dire need for more tutoring and mentoring. In fact there is a document in the Tutor/Mentor Institute's library called "University Connection," wherein the T/MC demonstrates how beneficial the T/M programs are for universities themselves, in an effort to secure an even greater investment by academia in T/M programs. Both of these are important (and needed) roles academia can play in their own best interest, and in the fight against poverty. His platform's focus on "Service" has been brought up a lot in recent weeks, and promises to be a focus of future political strategy. While Obama is busy campaigning for the Presidency at the moment, many Democratic U.S. Representatives are already serving as elected leaders, and are entrenched in positions where they can be unifying figures in his/her districts, serving to organize and promote service-oriented programs such as Tutor/Mentor Programs. 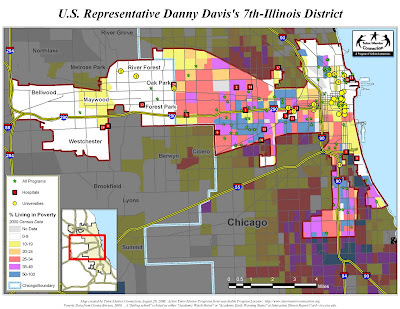 I would like to focus on the Illinois 7th Congressional District today - currently represented by Congressman Danny Davis - as another example of how the Tutor/Mentor Connection's (T/MC) maps can be used as tools to help politicians and their constituants work to create strategies that promote the development of tutor/mentor programs. Similar to Illinois Sentor Emil Jones, Congressman Davis works with a constituency that is split between city and suburban voters. This Chicago border marks a clear division between the highly impoverished West side, and the relatively affluent near west suburbs. Notice how commuters use the Eisenhower (I290) expressway, daily, to get downtown, bypassing the heavy poverty areas along the way. Commuter trains such as the CTA's green and blue lines also provide east-west access through the heart of the 7th District. 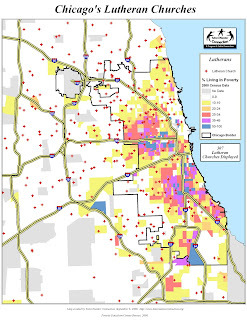 There is a noticible tie between "failing" schools and poverty visible on this map. Pockets of failing schools represent areas where students need more tutoring/mentoring than they are receiving. This has been looked at in detail in a recent blog. Fortunately, highways provide access for commuters interested in "service" to volunteer or make donations, in support of tutor/mentor programs in these areas of high poverty. 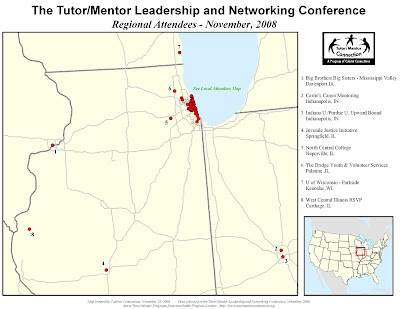 Descriptions of these individual tutor/mentor programs (green stars on the map) can be found using the Tutor/Mentor Program Locator Database. In this map, we show Universities and Hospitals that may (or may not) already be working with the district's tutor/mentor programs. As we've discussed in earlier blogs, Universities and Hospitals have important and intimate relationships with their communities, and can work to support the growth of Tutor/Mentor programs in their district. Imagine that each hospital or university on this map is hosting learning circles, with the organizations' leaders actively developing engagement strategies to reach youth throughout the entire district. For more information, please review the presentation for the Tutor/Mentor Hospital Connection. As discussed in the blog on Chicago's Places of Worship, the Tutor/Mentor Institute has a document called "How Faith Communities Can Lead Volunteer Mobilization For Tutor/Mentor Programs, detailing how "churches in affluent suburban areas, as well as in inner city areas, can be delivering sermons on a regular basis, that tie scripture and service, and point members to tutor/mentor programs that already exist, or to neighborhoods, where new programs need to be created." Here we look at Baptist churches, Catholic churches, and other "general" Christian congregations in the 7th. And here are the Episcopal, Lutheran, Methodist, and Presbyterian churches in the district. Again, each of these locations represent sites where congregations can meet to learn about tutoring and mentoring, and where church leaders can evangelize to get donors to contribute to the growth of programs. Please also take a look at Tutor/Mentor Institute's suggested communications strategy for Faith Communities. 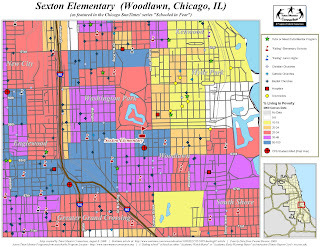 In general, I am hopeful that these maps can be used as important tools by leaders throughout Chicago who share the T/MC and Barack Obama's interest in "Service," and that hopefully a high powered political figure like Danny Davis can take a look at them, help mobilize other public and private leaders in his district, and build additional support needed for tutor/mentor programs. I should mention, if it's not clear, that these maps are not intended to show where service work is, or is not occurring. They are also not meant to endorse, or criticize elected leaders. The voters should make those decisions. There are at least 123 Presbyterian Churches spread throughout the area. 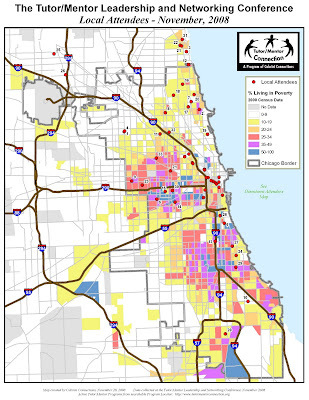 A handful are situated in the midst of heavily impoverished areas, but as you can see in this map, most are located in relatively affluent communities in the city and suburbs. Presbyterians in these affluent areas can be tying "scripture and service, and pointing members to tutor/mentor programs that already exist, or to neighborhoods, where new programs need to be created." 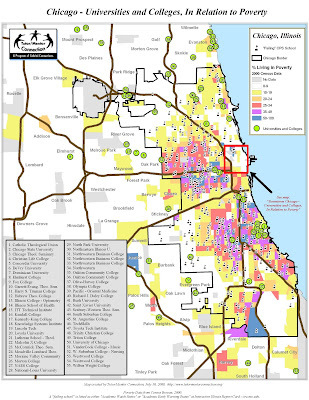 Please take a look also at the blog entry for Chicago's Places of Worship for more information on why this is important, and on how faith communities can use the T/MC's strategies to increase the reach, frequency and consistency of tutoring and mentoring programs. And as always, please visit the T/MC website to get information about programs in all parts of the region. And, check out the T/MC Program Locator, or the Interactive Zip Code Map to find locations of programs that can use your volunteer or donor help.